You are currently browsing the tag archive for the ‘farm’ tag. ‘Barnyard Bunk’ opens with a farmer at sleep at a farm, which falls apart. It’s soon clear the farm is destroyed by numerous cheeky mice. Enter Tom and Jerry playing saxophones. Their music makes a hen laying eggs, a cow producing tons of milk, and two woodpeckers producing a pile of wood. At one point all the lifeless objects of the farm start dancing. In the end the farmer pays the duo for the saxophones, but the moneybag turns out to be filled with mice. It’s quite shocking to see that in ‘Barnyard Bunk’, a film made well into 1932, still features animation language of the silent era. 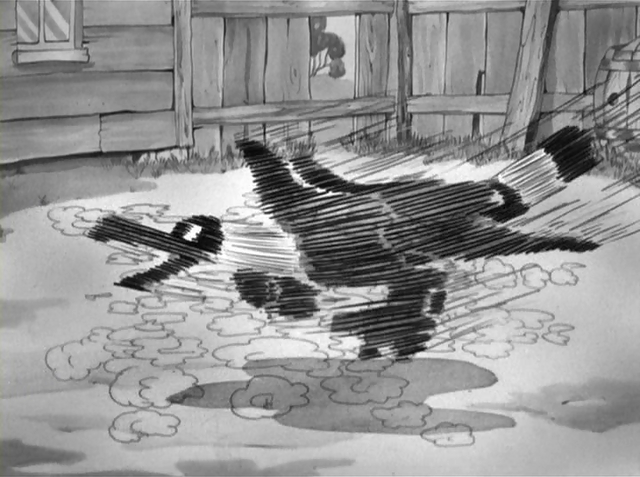 The short features no dialogue, and the gestures of Tom, Jerry and the farmer are still of the 1920s. The designs of the farmer and the mice do not fare better, and the whole cartoon exudes from archaism. Its only modern feature is the dressed cow, which shows that already by 1932 the Hays code was getting hold of the cartoon industry. ‘The Hill Farm’ is a long animation film exploring man’s relation to nature. First we watch the inhabitants of the hill farm themselves: simple farmers, who know the dangers and hardships of nature, and who treat their livestock without romanticism (as exemplified by the farmer’s wife killing chicken without ado). At one point the hill farm is visited by tourists, who are completely alienated from nature. One of them faints at the sight of the farmer’s wife killing a chicken. When confronted by nature’s dangers (as embodied by a gigantic bear-like beast) they don’t recognize the danger at all. To them nature is something to visit, something to make snapshots from. The third party is a group of huntsmen, who (try to) kill everything in sight, including even the farmer’s bees. The whole film takes place at a leisurely speed, without dialogue. Mark Baker’s visual style is simple, but very effective. His angular designs and graphic backgrounds are beautiful, and his animation has a unique timing, which is as comical as it is to the point. The narration is very open, leaving the interpretation to the viewer. The end result is one of the most beautiful animation films of the 1980’s.